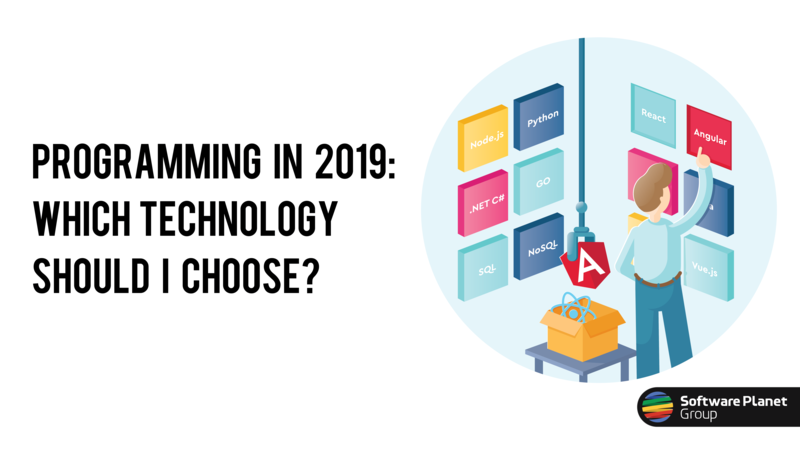 Programming in 2019: Which Technology Should I Choose? When it comes to deciding on a project’s programming technology, things can quickly take a turn for the murky. After all, though we are oftentimes certain of what it is that we are hoping to achieve, as soon as you throw in some complex technical details, it is difficult to determine if we are making the correct decision. Thankfully, however, Software Planet are committed to making this process as simple as is humanly possible, so for today’s article, we would like to walk you through some of the main technologies in use today and help you identify what you can do to yield maximum benefits. Though it hasn’t been without its ups and downs, for a number of years now, Java has been the go-to technology for large corporations the world over. This senior, de facto status not only means that it is clearly a very mature technology, but also that it may be used in web projects, enterprise resource planning (ERP) and customer relationship management (CRM) systems with great success and for years to come. In fact, of all the languages covered here, Java is perhaps best poised to serve companies in search of longevity, as in all likelihood, you’ll be able to find as many Java programmers today as you will be 10 years from now. On the other hand, due to the sheer amount of frameworks available for Node.js, finding developers to build your applications may prove significantly more challenging than anticipated, as not all programmers will be acquainted with every brand of framework out there, and becoming familiar with the framework you need should of course take a measure of time. Furthermore, because Node.js projects must invariably be shipped with their source code, should a hacker gain access to your company’s server, they’d be able to steal and even modify your product. Even so, however, in spite of these major risks, the technology still enjoys considerable niche success. Due to its incredible simplicity and ease of use, over the years, Python has also become surprisingly trendy. Today, for instance, it is especially popular among university students and because of the number of machine learning (ML) libraries it offers, it is the technology of choice for both ML and AI applications. On that note, by the way, should you choose to follow this route, it would probably be best to build the entire server side in Python, as using a single technology for the whole of an application will lead to both a simpler and much cleaner design. Next up are .NET and C# (pronounced “C sharp”). While .NET is a software framework for launching Windows applications, C# is the programming language that will specify how applications should work. When combined, .NET and C# are the natural choice for Windows systems. Regarding syntax, C# is fairly similar to Java, as when originally released, it was practically identical — and thus widely compared — to the latter. Over the years, however, the language has substantially evolved to possess its own distinguishing features. Developed by Google, Go — or Golang — aims to strip down programming languages to their basic, most simple components, and seemingly against the odds, the results are actually impressive. With Go, for instance, because you are able to build native applications without any intermediary code and launch it straight from the processor, Go’s disk and memory footprints are remarkably smaller in size, affording it better performance than all languages listed thus far. Nonetheless, because Go allows you to gain access to all major OS functions, the benefits to your business should certainly outweigh the cons. So to sum it all up, if your product requires plenty of processor time or could be labelled as time-critical — projects using the blockchain or cryptocurrencies would be perfect examples of this — if you lack computational resources, or are in need of microservices, then Go would undoubtedly be more than capable of fitting the bill. Until now, we have only examined backend technologies, so it is time to take a look at our options for frontend development. And finally, on the subject of data storage, you can either opt for an SQL or a NoSQL database. If your company has a need to organise relational data — that is, pieces of information that are somehow connected to one another, then you should probably make use of Structured Query Language (SQL). In this way, for instance, you can efficiently store and search through data concerning employees, their managers, and the top managers above them, as an SQL database should give you access to these with ease. In cases where no such data relations exist, however — a list of random classified ads, for example — you would likely fare best with NoSQL. While this would mean potentially having to do away with extensive filtering mechanisms, in turn, you would gain a straightforward and extremely fast approach to accessing your company’s information. We hope this has helped to clear up some of the confusion surrounding today’s technologies. Of course, success is never guaranteed, but by following the recommendations outlined in this article, you can harness the full power of each individual technology and invest them in a way that will make sense for your business.